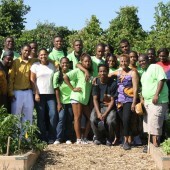 This case study describes the Cook County Green Corps program, a green job training program serving African American young adults from a low-income neighborhood. The program was implemented by an interdisciplinary organizing team to build knowledge, skills, and participation in sustainable jobs and urban agriculture among young adults. The trainees’ experience was documented by a program evaluation survey, environmental knowledge survey, and 1 year reflection interview. We summarize the experiential design, implementation and evaluation of the program. We discuss the limitations and the benefits of the program for trainees and the neighborhood. We share recommendations for future green job training programs that can best serve urban neighborhoods.